Wether you have already been student at our school or you have not yet, it’s clear to us that the only way to ensure good results is using quality and fresh products. Forget about artificial flavourings and colouring agents. Moreover, it’s particulary relevant to have good cooking equipment. High quality paella pans and burners specially adapted to your needs. To be used with bottled butane or propane gas as well as adapted to be connected to the natural gas supply network, for firewood cooking and even specially designed paella pans for ceramic and induction cooktops. Make sure about the quality of your paella set. There are cheaper products but it’s not worth saving in equipment that could ruin your culinary efforts. Your friends and folks deserve it. If you have any questions or doubts, please, let us know. We will be pleased to help you through our online chat or email. 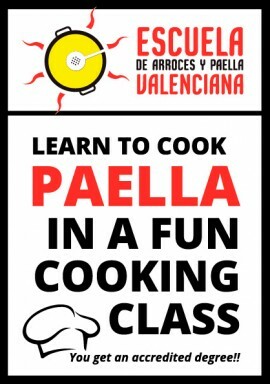 Bring back memories from the Escuela de Arroces y Paella Valenciana or just reveal the Chef inside of you! Choose from our selection of packs the best selection of products. The authentic and original paella anywhere in the world. 3D secure payment. Stay secure when buying in paellaworldwide.com. 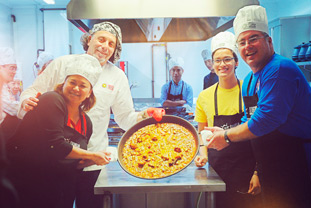 Consult our online paella experts.